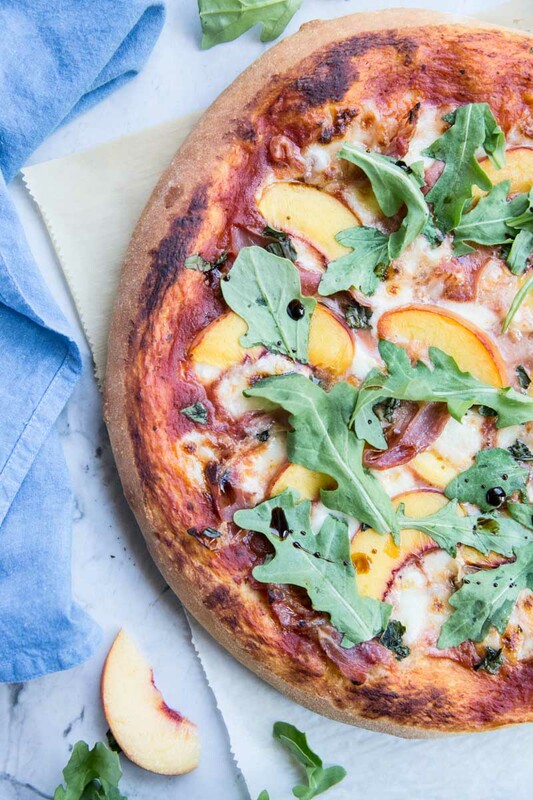 This Peach and Prosciutto Pizza is my favorite take on a homemade Hawaiian Pizza. 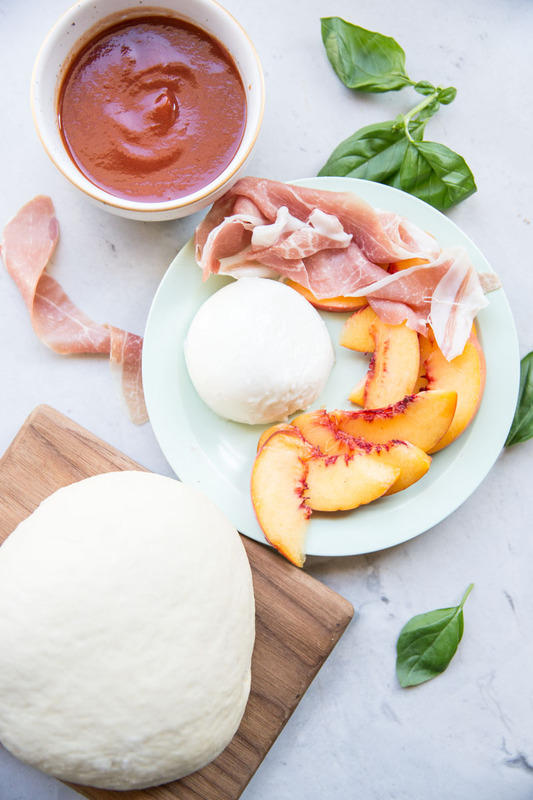 Sub out the pineapple for peaches and ham for prosciutto and you’ll be guaranteed a real treat. I have been making this pizza for a few years now and it’s a family favorite. 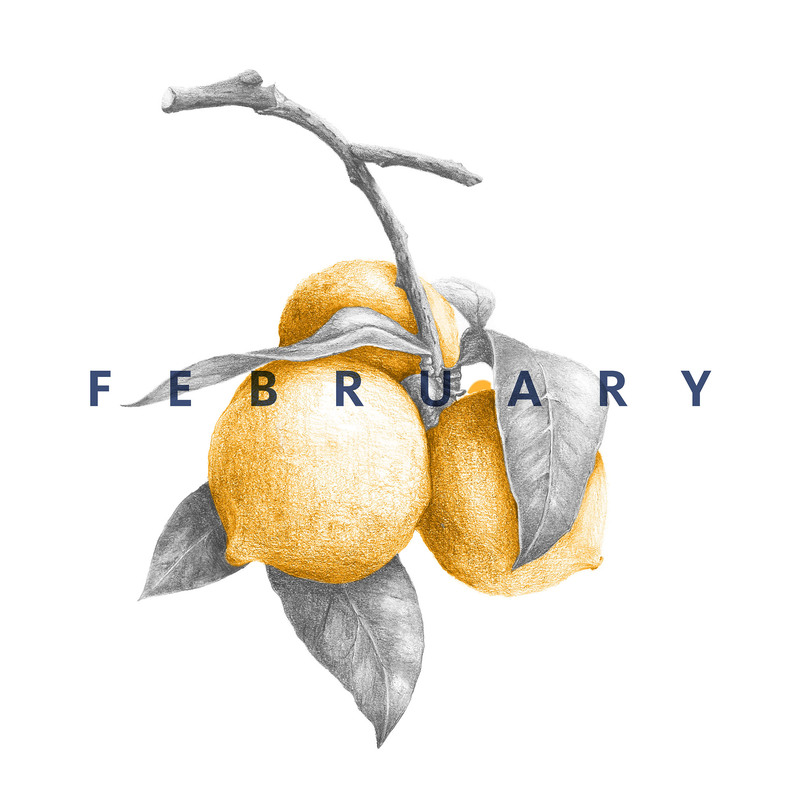 Basically, when I make it I’m guaranteed no leftovers (which makes me both sad and happy!) With peaches in abundance right now, they are basically going on everything we make, savory and sweet. Peaches with prosciutto are a favorite combo of mine. I have this Peach Prosciutto Salad that I’m obsessed with also, or you could simple wrap peaches up in prosciutto and place them on the grill for a real treat. They are pretty much a Summer match made in heaven. Original post from Aug 2017. Since we experienced a Solar Eclipse today we’ll be talking about it around are dinner table with a full moon shaped pizza to exhibit the eclipse with our kiddos. Plus the peach slices add a little eclipse symbolism as well. 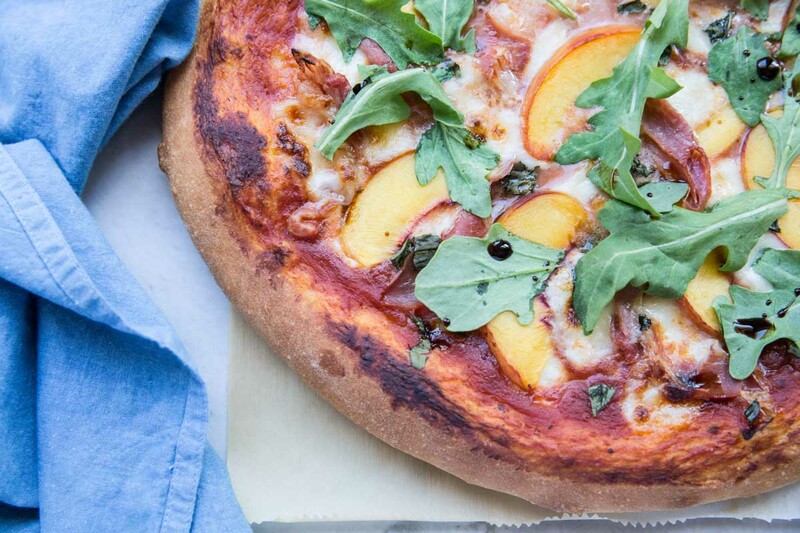 • I like this pizza with traditional marinara, or pizza sauce, and mozzarella but you could also go sauce-less and top it with more arugula and balsamic. 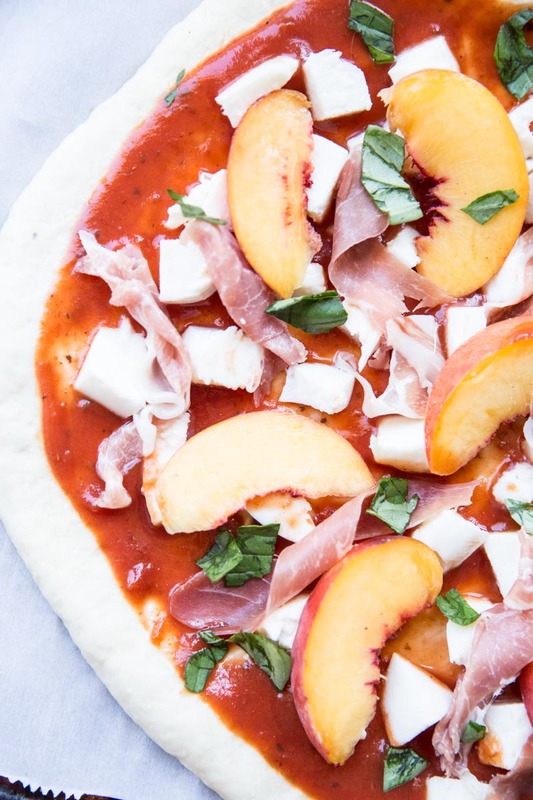 • Slice peaches thin and go for a slightly firm peach (not too ripe) or the pizza will be a bit soggy after it bakes. • I like to chop a fresh ball of mozzarella up for my pizzas but you could also use shredded mozzarella. If you’ve never experienced fresh mozzarella though I highly recommend it! Ask your local cheese counter if they carry it or if they know anyone in town making it from scratch… this is a game changer when it comes to homemade pizza. • For the prosciutto on this, make sure you get extra thin slices and I cut them up then twirl them up slightly before arranging them on the pizza. 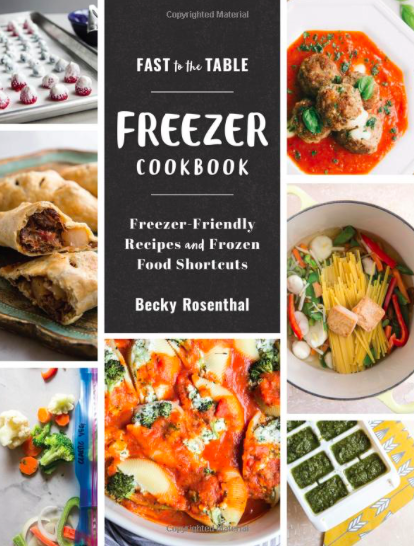 • As for layering, I like to layer sauce, then cheese, then toppings and finish with herbs. 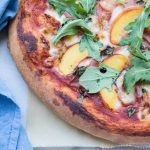 A fancy twist on ham and pineapple pizza using fresh peaches and prosciutto. Preheat oven to 475 degrees. Roll out the pizza dough on a lightly floured surface or pizza peel (turning and flipping as you roll it out to prevent sticking). Spread out the marinara over the dough leave about 1/2 inch around the edges. 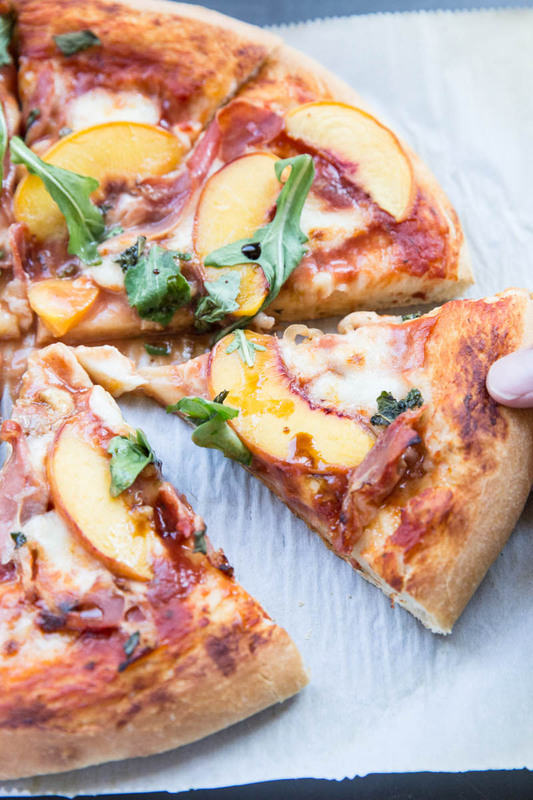 Top with mozzarella then peach slices and prosciutto (I like to tear the prosciutto and twist it slightly as I arrange it over the pizza). Sprinkle fresh basil over the pizza. Bake at 475 for 12-14 minutes. Then turn on broiler and move the pizza to the top level and broil (to brown the cheese slightly) for 1 minute. Remove from oven and top with fresh arugula. Drizzle with a thick balsamic and serve hot.